22 January 2019 (Toronto, ON) – The Comet Is Coming, “an improvisational, intergalactic mash-up” (The Guardian), will release their new album, Trust In The Lifeforce Of The Deep Mystery, on March 15. This will be their first album released via Impulse!/Universal Music Canada, the country’s leading music company. Their first-ever U.S. tour begins in Los Angeles on March 12 and takes them through SXSW, NYC, Philadelphia, DC, Big Ears Festival and finally lands them in Bonnaroo on June 13. 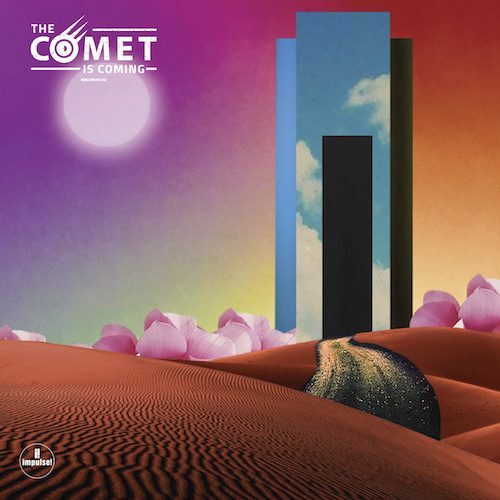 The Comet Is Coming, who in 2016 were shortlisted for the Mercury Music Prize, is comprised of King Shabaka (Shabaka Hutchings) on saxophone, Danalogue (Dan Leavers) on keys/synth, and Betamax (Max Hallett) on drums. On this album, Trust In The Lifeforce Of The Deep Mystery, the trio envisage a 21st Century take on spiritual jazz that is part Alice Coltrane, part Bladerunner. Pre-order the album HERE. Consider the titles of some of the trio’s new songs: “Because The End Is Really The Beginning”, “Birth Of Creation”, “The Universe Wakes Up” and “Unity”. This music brings us back into being through creation myths and the inception of life itself. Their arsenal: drums, synthesizers and saxophones alone. Listen to the pulsing “Blood Of The Past”, on which guest vocalist Kate Tempest delivers a state-of-the-universe address that somehow simultaneously summons the spirits of William Blake, Ian Dury, Carl Sagan and Stephen Hawking, all with wide-eyed awestruck wonder. Or “Summon The Fire”, perhaps their most accessible, riotous, and air-punching moment to date. Listen to “Summon The Fire” HERE. The trio are nothing short of alchemists, concocting a primordial stew of taut beats, sub-bass, and unhinged sax breaks. They paint pictures of astral planes and neon seas, with driving beats and celestial melodies. The Comet Is Coming formed in London in 2013 when the tall, “shadowy figure” of Shabaka appeared stage-side during show by Danalogue and Betamax’s formidable drums and synths duo Soccer96, sax in hand. Exploratory jams were immediately undertaken. Visions were experienced, dreams born. A member of Sons of Kemet and Shabaka and the Ancestors, Shabaka was already the MOBO-winning leading light of the contemporary British jazz scene. Make no mistake though, The Comet Is Coming are a three-headed beast, with all music co-written, and Danalogue and Betamax mixing and producing the record. The group signed to Impulse! Records in 2018, and this is their first release on the legendary label. They are among greats like John Coltrane, Pharoah Sanders, Alice Coltrane: fathers and mothers of the spiritual and transcendental jazz movements, among other legendary jazz artists. Impulse! Records was recently relaunched and is now operated out of the United States, sitting underneath Verve Label Group alongside other imprints such as Verve Records, Verve Forecast, Decca, Deutsche Grammophon, and more. Trust in the Lifeforce of the Deep Mystery.